In my search for my first DSLR Camera I've been doing tons of research and driving my hubby crazy with all the photography lingo I've been using lately, so I decided to stop pestering him and talk to some of my friends who share my same love of photography and I'm so glad I did. My friend Edith's boyfriend is a professional photographer and when he heard that I was going to purchase my first DSLR camera he insisted I purchase it through a company named B&H located in New York and I can't thank him enough for his advice. B&H has an enormous selection of new, used and *factory refurbished photo, video and lighting equipment; their staff is friendly and knowledgeable, their return policies and warranties are reassuring (even on their used and refurbished equipment) and their prices are great. After spending some time on their website and speaking to their staff personally, I decided to purchase a refurbished Nikon and two refurbished lenses from B&H and in doing so I saved over $400, paid no taxes (because they're in New York) and was able to make my purchase two months earlier than I expected. My camera should arrive any day now and I'm hoping that my review of B&H will be even better when it does! Photo courtesy of: "Scott Beale / Laughing Squid"
Yes, I am soo excited too about my purchase. I am so glad we did lots of research.. Always the best thing to do. And yes, B&H photo is one of the best places to buy. They have everything there.. I can't wait!! I know I'm really excited too, we've been working hard and saving up for so long! I can't believe that we thought of the same exact camera too before even mentioning it to each other (great minds, lol). Well, we should definitely take a class together and there's a really cool trip coming up. Happy, happy, joy, joy! Wow! I wish I had known about this when I bought my first DSLR. I LOVE my Nikon. Maybe I'll buy some lenses from them!! @Caroline, check them out, they have some really great deals. I'm glad you love your Nikon, everyone said Canon, but I fell in love with a Nikon! I'll post about it as soon as I get it. Thanks to you and Edith's boyfriend. We're very glad you're so pleased and we hope you get a lot of enjoyment from your new camera. Thanks for posting this. It's very gratifying. Can't wait to see photos with your new camera!! Oh that's awesome!!! I wish we had a place like that around here when my hubs was looking for a DSLR to surprise me with... He ended up going w/ Costco and I'm pretty happy w/ the purchase.. would've been nice to save some $$ though! Nikon girl here too :) I love B&H as well. Can't wait to hear more about your purchase. Thanks for following back and your nice comment! I added your button to my "Lovely Blogs" tab :) Have a great weekend! That is where I got my camera too! I love that place! I can't wait to hear how you like it! congrats for getting into photography! My guy is a total camera nerd now too hehe... So many new cameras all the time! It's so much fun though! I have't purchased from them, but I love browsing their site. I got my DSLR from ebay, from a New York store, and saved a few hundred dollars on it, because the box had been opened. Love it! Have fun with your camera!!! Thanks for visiting my blog. I LOVE my Nikon!! Always had Canon point and shoots but I researched thoroughly over a year on what DLSR I wanted and got a D90. While waiting for it, found a D40 at a clearance price and got it as a backup too! Which one did you get? 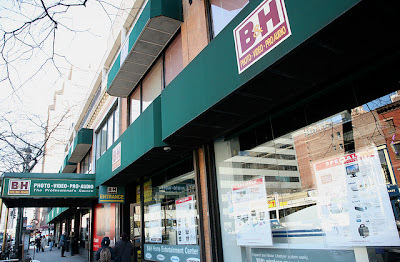 Taking a photography class now and she recommends B&H not only for price but they will really back up their stuff. Good to know! Thanks everyone for the input, now I'm feeling really confident about my purchase. @Adena, I'm posting my purchase on Monday, until then it's a surprise! LOL (I actually have something special planned for followers who love photography, so please come back and visit).